It is very characteristic that the enthusiastic apologists of the factory system have nothing more damning to urge against a general organisation of labor in society than that it would turn the whole of society into a factory. Of course. one wonders if the original German is just as or more biting than the English. Perhaps that’s an investigation for another day. This is the age of understanding and progress, so it’s only natural that psychiatry be our generation’s flagship academia. It’s hip, it’s open minded and it’s liberal. Gone are the atrocities of lobotomies and electro-convulsion therapy (also known as ECT.) More and more we are using simple doses of carefully engineered medication in co-ordination with what is colloquially referred to as “talk therapy” (also known as Cognitive Behavioral Therapy or CBT.) In his book, The Psychopath Test: Journey Through the Madness Industry, author Jon Ronson explores the transition between the old school horror show visions we get of insane asylums and straight jackets to our very open minded seeming and liberal modern psychiatric industry. Ronson, self-styled detective and author of Them and Men Who Stare At Goats, begins his journey with an unlikely request from a professor. This professor, and many others across the world, has received a mysterious book in the mail that can only be described as a puzzle unto itself. As Ronson begins his attempts to track down the author of the book and figure out why it was sent so prolifically to members of University academia, he finds himself drawn into a world of obsessives related to the book who quickly direct his fascination from the book to the psyche of the author and his own obsessions. In an attempt to better understand the obsessions behind the author of the mysterious book and his own growing anxiety, he begins speaking with psychiatrists related to the book. More questions without answers are growing in his mind and he shifts his focus, the book is no longer interesting, the brain is. What made the author so deluded and himself so chronically anxious and troubled? Thus starts Ronson’s “Journey Through the Madness Industry.” What follows are meetings with disbarred psychiatric doctors who’s unsuccessful and radical treatment techniques earned them a career exile. Once proud and ground breaking facilities such as Oakridge in Canada that tried to turn psychopaths into normal humans by dosing them with LSD, cramming them in an isolation room together naked, and letting them treat each other for as much as a week straight. Ronson travels the globe speaking with both shamed psychiatrists and lauded ones such as Dr. Robert Hare. Dr. Hare invented the PCL-R, the psychopath checklist revised. This checklist is used on modern parole boards across the United States as well as other countries to help determine if the prisoner would re-offend due to his or her possible mental status as a psychopath. 20 questions this test consists of, score too high and you may never be released. Armed with the PCL-R and a preparatory course on it’s use, Ronson continuously travels trying to ferret out psychopaths in our midst. 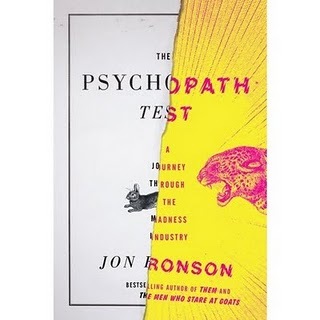 The Psychopath Test: Journey Through the Madness Industry is a stirring recounting of Ronson’s very personal sleuthing into the validity of modern psychiatry. What started as a few questions leads to interviews with both modern and recent psychiatrists that expose what makes the sane different from the sane, and whether our modern treatments are any less barbaric than those we so often shame. This book runs the risk of seeming preachy, baring an agenda, and inhuman but Ronson never ceases to put his own feelings, doubts, and fears into each and every inquiry. What results is a novel sized investigative journalism article that is both heart breaking, awe inspiring, and intermittently hilarious. Ronson’s brilliant interviewing style exposes the guilt, shame and pride held by some of the most daring psychiatrists in recent history. His talks with Dr. Hare being the most profound example. Dr. Hare, the pioneering psychiatrist in the research and understanding of psychopathology, is intensely proud of his psychopath test but also deeply ashamed at it’s modern uses. The passion and love that these psychiatrists have for their work is clearly evident. Ronson does not stop at simply speaking with the men who charge by the hour to hear your problems, he also delves deeply into the lives of those affected by the engine of modern psychiatry. This is particularly evident in the relationship Ronson develops with a young man who has been imprisoned in the notorious psychiatric hospital known as Broadmoor. Home to serial killers, serial rapists, and the worst of Britain’s criminally insane. This young man, charged with assault at the age of 17 reported that he faked his way in to get out of 7 years of jail time. Ronson finds him at 29, having spent 5 years longer than his initial sentence, imprisoned; almost half of his life spent in Broadmoor. This man has been diagnosed as a psychopath. What follows is the friendship between Ronson and the anonymous psychopath’s pleas for help in being released. Ronson expounds on his deeply personal doubts about the true state of his friend’s mental health, what makes psychopath’s so dangerous, why our culture is attracted to insanity, and whether we are medicating and treating people who are completely normal in this terrifically sincere book. Sci-Fi Convention Coming to Reno August 17-21! Hey Reno nerds, geeks and other related subcultures! It may surprise you to find out that the grand poobahs of science fiction will be convening on our fair city this very month for several days of scientific and fictional action! Have you ever heard of the Hugo Awards? The awards are a very prestigious recognition of the best works of science fiction to come out in a given year. Categories include novels, novellas, short stories, graphic novels, editing, zines, fanfic and more. These awards are given out at the World Science Fiction Convention, in Reno, August 17 – 21. The convention will be based at Reno-Sparks Convention Center and the awards ceremony will occur at Peppermill. So if you’ve got the bling, and the ganas, join musical guests Trixie Pixie, comic superstar Bill Willingham, guests of honor Ellen Asher, Tim Powers, and Boris Vallejo, for 5 days of geeky goodness including the aforementioned awards, a Masquerade, a film festival, art show, plus readings and Q&A sessions with writers Cory Doctrow, Walter Jon Williams, Connie Willis, Jo Walton, Steven Gould, Sharon Lee & Steve Miler, and Carol Berg at the Sierra View Library on Wednesday, August 17, starting at 11 am. That’s a lot of high caliber readings for Reno, on one action packed day. Book nerds, you have one week to get the day off work. This is a pretty sweet event to be landing in Reno. If you’re into sci-fi at all, you’ll kick yourself if you miss it. Consider yourself notified. 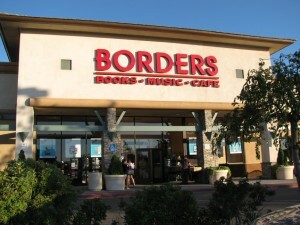 The End of Borders, Bookstore That Is. The Borders bookstore in Reno, NV on 7/19/2011, a day after the liquidation announcement. Borders is finally liquidating and going out of business. It was already in Chapter 11 Bankruptcy since February, but now they’re clearing out their stock (probably starting Friday, July 22), laying off 10,700 of their employees, and closing all their stores across the US. This was announced on Monday at the end of the business day, at their headquarters in Ann Arbor, Michigan. Here’s the letter from Border’s CEO to his employees about the current situation.I’ve been waiting for this to happen for the last year and a half, and now it has. Another chain bookstore gone from the US and now fewer places for people to buy books new. So what? 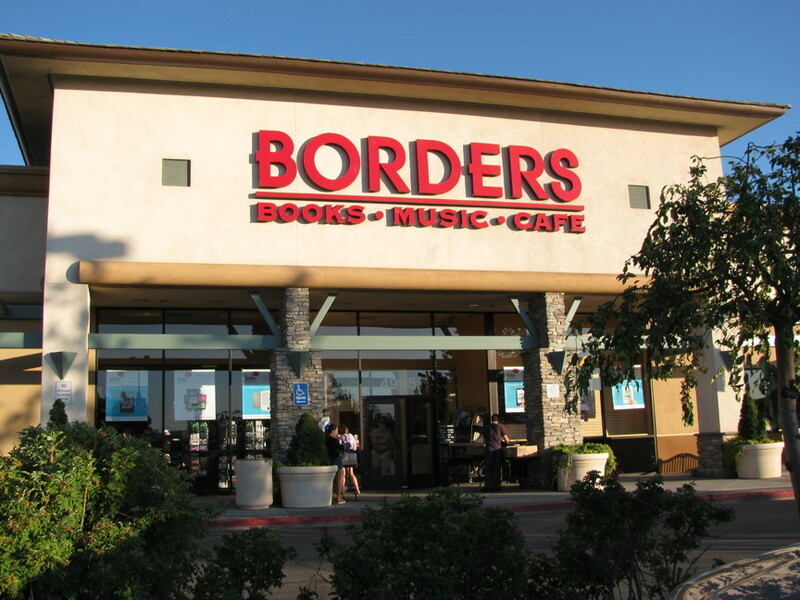 Now that Borders is closing, there’s just going to be less opportunity to get to books for many people. Sure, you can get books in Wal-Mart or Target, but most of those are the “best sellers” with a few religious books, some current non-fiction, novels of various genres, and juvenile and children’s books. Bookstores have more than just the best-sellers and safe books- they even have books that could elicit thought and other dangerous activities. What activities? Like having a conversation with other people not on a computer; buying a calendar that’s not fuzzy kitties or of historic lighthouses; browsing through stacks of books to find something you didn’t know that you really needed; being able to buy foreign magazines and newspapers, and just newspapers and magazines in general (in Reno, Borders had the best newsstand in town); and being able to go somewhere and have coffee and read and spend an afternoon in a relaxing, quiet place. There is a solution to this dilemma. The thing to do is to support local bookstores more now and buy book from them. Reno has a great independent new bookstore, Sundance Books, and several good used bookstores, Zephyr Books and even Grassroots Books. Sure- there’s the Internet and buying books online, which I do. But, if you can find a book locally, why not buy it and keep your money where it can circulate in your own community and do more. Keep buying books locally and keep reading, and thinking. The strangest thing for me is this: I went over to Borders to take some pictures of the outside for this piece and it looked like it’s always been since it opened: with people sitting in the café drinking coffee, meeting and reading, media bought and sold, and people milling around and going here and there. There are no notes, banners, signs, or anything to tell customers that Borders will soon be out of business. The Internet has really changed the way we do things, and it’s getting to the point where we almost take it for granted. Generations like mine (as a mid-thirtysomething) can certainly remember times when we did things “the old-fashioned way,” such as using our minds, pencils and papers to write or research something. We were also the first generation to grow up using computers as an every-day interaction in our schools—-I began school in 1984, which means we had a library full of Apple IIe computers that all the classes used. Once a day, we got one hour on the computer. There was a computer in my learning curve ever since, and little has changed today. One thing we don’t realize is the valuable process we lose by using the ever-increasing technology that we enjoy on a daily basis. I know a couple of friends of mine jokingly were calling any phone with any kind of Google searchability “The Oracle,” as questions can and will be answered. I’m only getting to the point now where I realize I have a pocket full of information with my phone, which makes us only more interdependent on our silicon-based lifestyle. One that will poke us in the ribs every time someone tweets, messages or demands our instant attention, no matter what we’re doing. I’ve done everything I can to make me in control of my blasted phone, rather than the other way around. When I write, it is usually on a computer. A once-steady hand of pen-holding and paper medium, I probably couldn’t write more than a page or so before my hand started to cramp up. Muscles gone to hell in a once proud method I used constantly, before this infernal laptop and phone began routinely joining my travels. Similar as it goes, according to this article, those seeking a writing refuge in Iowa City, long known for its tradition in writing, will find many using the old ways, and sternly encouraged to do so! From a lack of distraction to a long history of fiction writing that has become a cultural norm there, it’s good to see people even attempting to find out what writing, publishing and the writing environment really means without necessarily the help of some kind of bothersome technology. You know when it’s become part of our comedy routines, it’s at least common enough to question how technologically-reliant we are, or the common denominator like an informational website like Wikipedia being the first (and sometimes only) stop in our quest for knowledge. At the same time, what would have happened in 1984 when I was in school had things been different, or say I was a first grader right now? Likely, if I wasn’t being forced to do some kind of research in a stinky, old library with stinky, old librarians, I’d probably be ignorant to my subject matter, or at the whim of some teacher’s interpretation of the information. Wikipedia, arguably, if not correct, at least naturally opens doors in which we didn’t have back then, either. Otherwise, ignorant of information we would stay, unless that is, we stuck with stinky, old-fashioned learning and continued into higher education. It’s a pointless battle to choose sides and say one is superior to the other. Long have we had the information and we have been just as dedicated (or lazy) at obtaining and retaining it, and perhaps we just have to remember the experience is best, and we’ll leave that up to the individual to discover (or rediscover, if you will). Distracted or not. 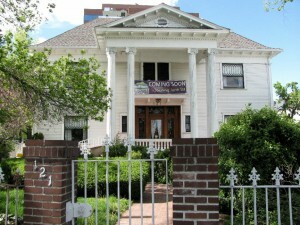 The Levy Mansion and soon, the new home of Sundance Books. Moving a bookstore is very hard work, I know it from firsthand experience, having done it three times. The first time was when I worked at Black & White Books and we moved from Wells Avenue to Lakeside in the Moana West shopping center. The second and third time was when I moved my own bookstore, Truckee River Books, from one house to another. I once heard of a man moving an entire bookstore from Zurich, Switzerland to Dayton, Nevada and it was an amazing old bookstore with incunabula, antique and rare books, and old maps. In general, moving books, or at least a lot of books is an arduous and difficult process. Moving a bookstore is awesome achievement and it means that you, as a bookseller are able to continue. So, to be able to move an entire bookstore in two weeks, like Sundance Books intends to do is a very awesome thing indeed. Sundance intends to close up their store on Keystone during Memorial Day weekend and be open on June 1st in their new location, the Levy House at the corner of Sierra and California, near the Nevada Museum of Art. 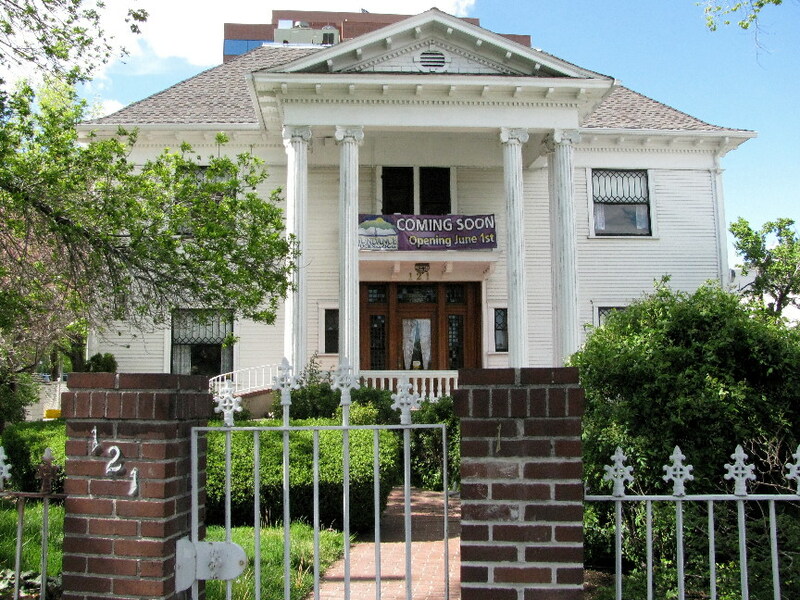 The Levy House is a fine old mansion that will be a great place for a bookstore. Not only that, it puts Sundance Books downtown, in a good place that’s not so out of the way for most people. I know I’ll be there for the grand opening and I hope that this will be a great new chapter in Sundance Book’s history. Let’s buy some books and make sure they stay there for a long, long time. 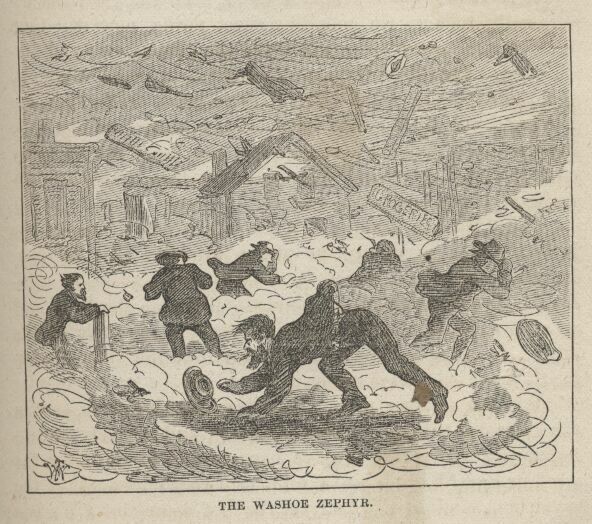 A typical Nevada afternoon, thanks to the Zephyr. Illustration from Mark Twain's Roughing It. You can say a lot of things about the weather here in Nevada, but if you can’t have a bit of humor about it, it might just drive you crazy. Anyone who would professionally forecast weather for Nevada is either just reading it off of a computer screen, like all the TV weathermen (who become DJs after their stints as the weather readers) or make their best educated guesses and sometimes are spectacularly wrong. As I’m writing this, it’s snowing outside: big snowflakes like you’d have in January or February. And this isn’t uncommon at all. I know it can snow in Nevada all the way into June and July, and possibly in August in the highest elevations. Of course, by the time I finished writing this, the snow stopped and the sun peeked out of the clouds. The forecast for tomorrow? Sunny and in the 60s, and probably by the weekend it’ll 90 degrees and not a cloud in the sky. Is “any exposure good exposure” for a city? That’s the question on the agenda today with news of the filming of the cinematic adaptation of Willy Vlautin’s book The Motel Life going on in town right now. An article by Forrest Hartman in the RGJ today looks at several examples of how exposure of a city’s supposedly undesirable qualities in movies or TV can generate tourism. The tone of the piece seems to indicate that the sky is not falling, if people see something a little outside their comfort zone for their own town, they may still be attracted to Reno as a place to visit. Frank and Jerry Lee Flannigan are two down-and-out brothers who live a meager existence in Reno, Nevada. Both men are high school dropouts who live in cheap motel rooms, work at odd jobs for money, and drink heavily. One night, while driving drunk during a blizzard, Jerry Lee accidentally hits and kills a teenage boy on a bicycle. 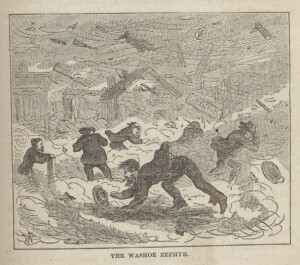 Although the accident is the boy’s fault, there are no witnesses, and Jerry Lee is certain that the police will put the blame on him. He convinces Frank to leave town with him and flee to Montana. Along the way, Jerry Lee abandons Frank in Wyoming and then burns the car in a secluded Idaho forest. Both men return separately to Reno. Do they become trapped in Las Vegas and start living in motel rooms, committing crimes and running from the law? Nope. Las Vegas’ image is untarnished, the place where people who are well-to-do enough to travel across the country for a bachelor party have crazy things happen to them before everything returns to normal and they go home. Score one for Vegas. Another example is Love Ranch, a movie set in Reno based loosely on the story of The Mustang Ranch brothel. A story set in a much busier, more glamorous Reno area, about something that is enticing and alluring to many from outside the area. Score one for the legendary status of The Mustang Ranch. How about The Vampire Diaries? The small Georgia town where this TV series is filmed draws visitors from all over the world who want to see the town where the show is set. It’s a regular place, and we all know vampires don’t really exist. Sort of a Twin Peaks effect. Score one for fantasy. Willy Vlautin is a talented musician and author, he’s from Reno and he knows a thing or two about his subject matter. In this case his subject matter is the very real social problem of derelicts and vagrants living two-bit lives out of weekly motels, parked directly adjacent to liquor stores, availing themselves of the resource and becoming trapped in a lifestyle which can only lead to tragedy. There’s something to be learned in his story, and it’s a good thing it’s being made into a movie. It’s a good thing the location chosen for filming is the location of the setting. It will undeniably be a powerful piece of cinema. So, not to be too much of a cynic, but (here it comes), it seems to this author as if the only tourists a movie like that will attract are the people who will become trapped in the story. Score one for social ills. And a big goose egg for Reno. Most rational adults know Professional Wrestling is fixed and scripted. Yet, people still watch it and enjoy it. Fans of other sports such as baseball, football, and basketball have been able to say that their favorite sports were free from fixing and cheating. This was never the case in the past- look at the 1919 Black Sox scandal in baseball, where the Chicago White Sox were accused of being paid to throw the World Series and allow the Cincinnati Reds to win. Remember Pete Rose, who bet on his teams to win and was banned from baseball because of it? How about the steroids scandals of the 1990s and 2000s in baseball? In 2007, Tim Donaghy, a referee in the NBA was accused of helping a professional gambler make sure he won his bets on games, and was paid for it. And, Donaghy said 13 other referees were in on the deal. There was the 2002 Olympics judging scandal and that’s just one of the many Olympic scandals. And soccer all over the world, including the World Cup, has many, many scandals of fixing, cheating, and doping. The bottom line is this: professional sports in the US and around the world is big business and people and corporations with billions of dollars at stake wouldn’t leave it up to chance. Like Joe Namath, one of the most famous quarterbacks of all time, says about sports and the business of sports: “I’ll never forget this. I had dinner with the Werblins (the owners of the New York Jets, the team he played for) one night — this was late in the 1960s — and Sonny was telling me, ‘You’re a confident guy. Be more open, it will be better for everybody.’ And I kept saying, ‘It’s just football. How much is there to talk about?’ So finally, his wife leans over and says, ‘Joe, don’t worry, honey. It’s all just show business,’ and she turned out to be right.” The Fix Is In by Brian Tuohy is about the show business aspect of sports and how it effects players, the owners, and the spectators. In a very clear, and concise style, along with all the references, quotations, and a great bibliography, Tuohy takes the reader behind the scenes of the show business of professional sports, specifically baseball, football, basketball, hockey, and NASCAR. He looks at the various sides of sports from all the sides, recounting a brief history, and lays out his thesis that the management and owners of the various professional leagues in subtle ways manipulate the outcomes of games and seasons to make the most money. He also lays out various scandals in all those sports as well as explains some conspiracy theories that might prove his theories. He goes into a lot of detail about Michael Jordan and his gambling problems and retirement from basketball to play baseball. Tuhohy writes a very interesting look at professional football since the 1960s, showing how it became the most popular And, there’s an analysis of the last ten or so Super Bowls, which more than proves his point of fixing games with several of the more unexpected outcomes explained and laid bare. I’ve always thought that basically, sports are soap operas with very good athletes in them, that are shown on TV and that you can actually go and see live. After all, you have a continuing story line that goes for months and months, that people completely obsess over, and base their lives around. Not to mention that a part of a person is their favorite football or baseball team and sometimes they put a bit of money on them and hope they win it back. For those sports fans who aren’t a bit cynical, The Fix Is In is a good book to read and think about, since pro sports is big business. 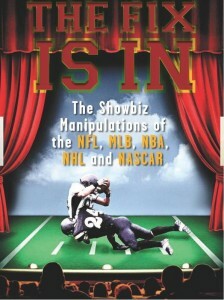 Cynical sports fans will agree with the book and feel rewarded in their cynicism. After all, it’s only a game, right?